TDK ETVT20102 USB review | What Hi-Fi? We haven’t been impressed by the general standard of USB turntables. Those we’ve seen have tended to been cheaply made and haven’t sounded particularly good. This TDK is way better than most. Yes, it costs much more than most USB equipped rivals but the pay-off is vastly more solid build and an engineering integrity sadly lacking in cheaper rivals. 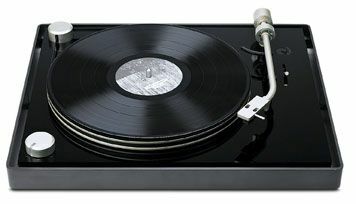 In simple terms, this is a belt drive turntable with electronic speed change and a built-in phono stage. The on-board phono stage is no great performer, lacking the transparency and dynamics to worry Cambridge Audio’s £60 540P. But, it’s workable and relatively balanced. The deck as a whole delivers a decent degree of insight with the likes of Fourtet’s There is Love in You and REM’s Man on the Moon. There’s a good dose of fluidity, and the ability to keep instrumental strands separate and easy to follow. In sound quality this TDK deck is eclipsed by the likes of Rega’s terrific RP1, and it’s tempting to suggest buying one of these plus a good USB phono stage such as Pro-Ject’s £130 Phono Box USB instead. If performance were paramount, that’s the way we’d go – but we can’t help admiring the TDK’s build and ease of use. This deck is a simple solution that makes the laborious task of archiving vinyl onto a computer easy. Whatever its shortcomings, that fact shouldn’t be ignored.